Worst part: The near-laughable bleakness. 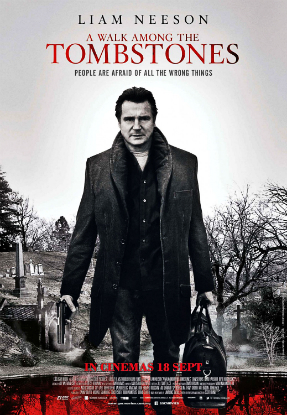 Believe it or not, grimy pot-boiler A Walk Among the Tombstones is a game-changer. Recently, a specific trend has pulled scores of action-loving cinema-goers back to the theatre. This particular current, sprouting up only a couple of years ago, has been kind certain demographics. In addition, the big-name actors involved have been given full-scale career revivals. Thanks to Kevin Costner vehicle 3 Days to Kill and Denzel Washington/Antoine Fuqua’s latest collaboration The Equalizer, this resurgence of veteran anti-heroes shows no sign of slowing down. Liam Neeson shuffling through action-thriller premises. With A Walk Among the Tombstones, one headliner is making amends for recent poor career choices. Liam Neeson, despite being one of Hollywood’s most popular leads, has recently been dealt several hits and misses. Since 2008’s surprise hit Taken, the Irish badass has landed major studio gigs from The A-Team to A Million Ways to Die in the West. Picking every script he’s given, his immense charisma and professionalism support his A-list status. Having languished in Non-Stop‘s reputation-destroying aura, his latest effort makes for a remarkable return to form. The story, despite resembling Neeson’s preceding sleep-walk-like efforts, delivers enough thrills to win over detractors. In the first scene, set in 1991, troubled detective Matthew Scudder (Neeson) – whilst on duty – walks into a bar, downs an Irish coffee, then skims the headlines. Soon after, three latino gang-bangers kill the bartender, steal some cash, and leave. After Scudder thwarts the robbery, the movie jumps to 1999. We then follow Scudder – now an unlicensed private investigator aided by Alcoholics Anonymous – through the ultimate doomsday mission. Hired by notorious drug kingpin Kenny Kristo and his dodgy brother (Boyd Holbrook), our lead tracks down Kenny’s wife’s kidnappers. 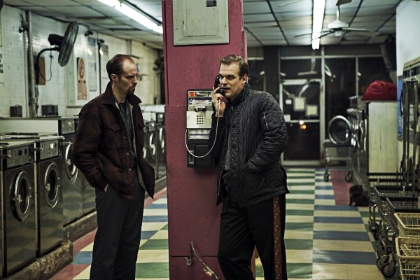 The perpetrators, Ray (David Harbour) and Albert (Adam David Thompson), are on a kidnap/murder rampage without end. Along the way, Scudder’s friendship with street urchin T.J. (Brian “Astro” Bradley) becomes a distraction. 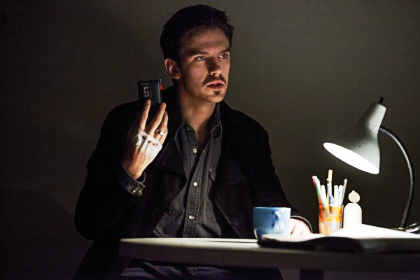 Dan Stevens continuing his remarkable hot-streak. Based on Lawrence Block’s highly-rated crime novel, A Walk Among the Tombstones tackles the famed writer’s tropes with vigour and confidence. The narrative, etching itself into the consciousness, embraces its airport-thriller roots whilst crafting its own identity. Teetering between Neeson-action and crime-thriller ticks, the movie’s intentions strike a chord. Unlike most ‘Neesoners’, known to delve into dull pure nonsense, the movie’s existential shades and killers-punishing-criminals premise elevate it above most big-budget schlockers. As one of 2014’s more invigorating efforts, the story steadily, and intelligently, moves from one plot-point and revelation to the next. Like with Scandinavian detective-thrillers, the narrative revels in the genre’s darkest-possible tones. As the investigation takes several disturbing turns, the movie switches between grounded character study, fun actioner, and bleak crime-drama. From the first highly disturbing frame onwards, writer/director Scott Frank (The Lookout) succinctly, and passionately, delicately covers the material’s moral, ethical, and thematic depths. Examining every intrinsic detail, this adaptation turns mind-numbing and derivative ideas into worthwhile bursts of energy. His narrative, breaking off into slight sub-plots and character arcs, injects emotion and stakes into key moments. However, with Frank’s infatuation with Block turned up to 11, the darkness becomes laughable within the second and third acts. “I do favours for people. In return, they give me gifts.” (Matthew Scudder (Liam Neeson), A Walk Among the Tombstones). Our killers on the loose! Fuelled by unlikeable people, disturbing crimes, paranoia, and tragic backstories, this concentrated dose of evil becomes tiresome and nonsensical. By setting this action-thriller in 1999, themes of identity crisis and man-made chaos come with the territory. Sadly, the Y2K commentary escapes the central, police-procedural plot-line. Reserved for only a couple of throwaway lines, the themes rift against the cop-thriller vibe. However, despite the over-ambitiousness, Frank still crafts emotional heft whenever possible. Thanks to Mihai Malaimaire, Jr.’s cinematography, the movie’s atmospheric aesthetic bolsters Frank’s straight-laced direction. Adding unique camera angles and movements to peculiar sequences, his flourishes bolster this otherwise morbid experience. In addition, the sound design amplifies each action beat. Elevating Scudder’s significant presence, the gunshots and punches strike with brute force. Despite the positives, the movie occasionally delves into bafflingly pretentious tangents. Marked by slo-mo flourishes and a manipulative score, certain scenes do little but extend the movie’s egregious run-time. However, even in its corniest moments, Neeson’s otherworldly aura lends gravitas to this stock-standard crime-thriller. Fitting the tragic anti-hero role like a glove, his thunderous tone and impressive frame make up for the character’s cliched development. Boosting his polarising action-hero resurgence, the movie makes for a major step in the right direction. In addition, Stevens, a breakout star thanks to Downton Abbey and The Guest, excels in his underwritten, Red Herring role. 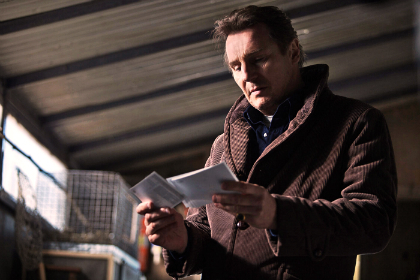 Resembling 90s-style crime-thrillers like Ransom and Payback, A Walk Among the Tombstones comes off like a Mel Gibson vehicle driven by a universe-conquering Irishman. Bolstered by Neeson’s monstrous aura, the movie excels whenever he’s on-screen. Thankfully, that’s most of the time. However, despite Frank’s competent screenplay and direction, some stylistic and thematic choices hinder this hearty effort. Adding to 2014’s film noir/crime-thriller resurgence, the movie flaunts Hollywood’s gothic/manic-depressive side. Verdict: Neeson’s notable return to form.